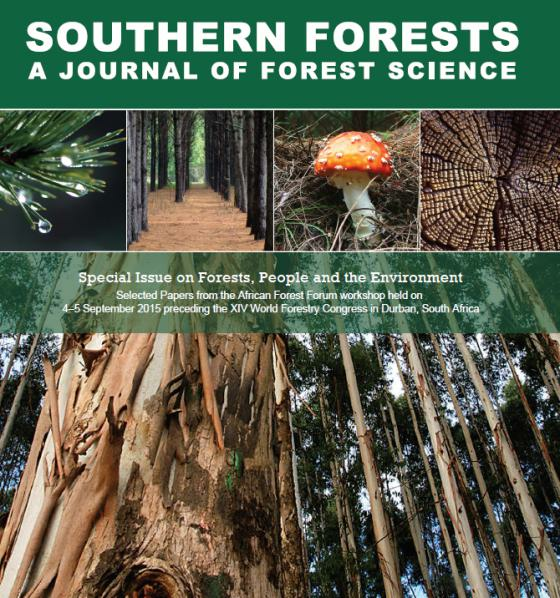 Southern Forests Vol 79 issue 2 is a special issue on Forests, People, and the Environment. Selected papers from the African Forest Forum workshop held on 4-5 September 2015 preceding the XIV World Forestry Congress in Durban, South Africa. The workshop was structured under the following subthemes: rehabilitation of degraded lands using trees; managing forests in the context of climate change; forest governance, marketing and trade in forest products; and socio-economic issues in Forestry. In this issue, the main drivers of land degradation are highlighted vis a vis population growth, agricultural expansion, climate variability, drought and energy needs. Chirwa, Mahamane and Kowero, in their overview, “Forests, people and environment: some African perspectives,” note that the issue also highlights the methodological challenges of quantifying carbon in African forests. Finally, the issue covers a people-centred approach in tree planting and management, where studies demonstrated that there are still problems of poor participation of local communities, due to poor implementation of enabling policies, lack of involvement in initial planning and subsequent lack of clear benefit-sharing mechanisms. Also reported in this special issue is an evaluation of the expected return on investment in these resources made for products from various tree species at their rotation age (the time of their harvesting) and considering forest carbon offsets in the compliance and in the voluntary markets as explored in eastern Africa. The studies in this issue underscore the importance of forests to the livelihoods of African people both in rural and urban areas through the ecosystem goods and services highlighted. The studies also emphasise the need to recognize traditional forest management practices, institutional frameworks and ecological manipulation of the forest species in order to contain degradation through forest and tree restoration, and promote favourable adaption approaches to climate change. In concluding their overview Chirwa, Mahamane and Kowero state that poor participation in the management of the forest resource, weak policies on land tenure, and lack of capacity and skills for value addition and marketing, must be addressed in order to encourage local communities to become viable custodians of the forest resource for future generations.